Recently my young friend Leah was traumatized by a spaghetti squash. A few minutes after putting a prime specimen in her microwave, it exploded like a bomb, blew open the microwave door and sprayed half the kitchen with sticky strands of squash. Note: The safest way to cook a whole spaghetti squash is to use a slow cooker. Before baking, steaming or microwaving spaghetti squash, they should be cut in half. Surely such calamities have befallen others, because many cooks and gardeners are trying spaghetti squash for the first time. Most of today's trendiest food labels apply to spaghetti squash – gluten free, low carbohydrate, high in vitamins and fiber, and often locally-grown. 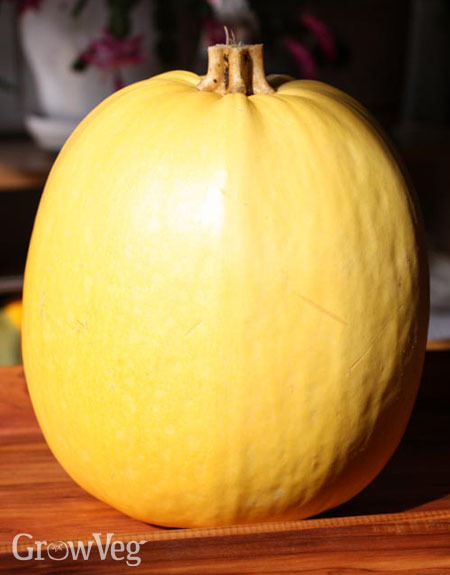 Closely related to summer squash (young spaghetti squash fruits look like short, stout zucchinis), spaghetti squash mature faster than most other winter squash, producing mature fruits about eight weeks after planting. Originating in Mexico, spaghetti squash were probably first grown as a companion crops, to cover the ground between hills of corn. Most open-pollinated varieties eagerly run 15 feet (5 meters), often developing supplemental roots where stems come into contact with moist ground. In North America, the supplemental stems serve as the plants' back-up plan should squash vine borers kill the plant's primary crown. To accommodate the long vines, I suggest growing spaghetti squash outside the garden, where the vines can temporarily cover a section of lawn you don't want to mow. Where space is tight, small-fruited varieties can be trained to grow up a fence or trellis. Growing spaghetti squash is especially easy of you choose your site ahead of time, and create a customized compost pile into which spaghetti squash seedlings can be planted come spring. Spaghetti squash thrive when grown in a thoughtfully-composed pile of rotting leaves, manure, soil and composted garden waste. Like other squash, spaghetti squash produces male and female flowers, which are typically pollinated by bees. You will need to grow at least four healthy plants to have enough flowers blooming at once to get good pollination, or simply grow another type of summer squash nearby to increase the pollen supply. Starting seeds indoors, so you can set out stocky three-week-old seedlings as soon as the weather warms in early summer, can help insure a good crop in cool climates. Assuming things go well, each plant will produce four to five fruits, which should be cut and cured like pumpkins and other winter squash. When harvested with a stub of stem attached and allowed to harden under warm conditions for a few weeks, spaghetti squash will keep for up to three months if stored in a cool, dry place. This is not very long, so it is best to cook and eat spaghetti squash before moving on to butternuts and other winter squash that store much longer. The cooking process naturally causes the flesh of spaghetti squash to separate into noodle-like strands. Traditionally, a clean squash is cut in half and placed cut side down in a large baking pan to which a cup of water is added, and baked for about 30 minutes, or until just done. When cool enough to handle, a fork is used to tease out the strands, which can be refrigerated until you are ready to use them in a recipe. Strain off the liquid that accumulates in the container. The first spaghetti squash recipe to try is also the simplest: Toss hot spaghetti squash with butter, salt and pepper, and top with a sprinkling of sharp cheese. Next, go Asian by using spaghetti squash as a substitute for cellophane noodles in a hot and sour soup. Spaghetti squash makes a surprising (and pleasing) addition to egg dishes like omelets, frittatas, and spaghetti squash fritters – little pan-fried pancakes bound with flour and egg that get slathered with a spicy sauce before serving. Personally I think a cheesy spaghetti squash gratin is the finest of all spaghetti squash dishes, which is what Leah planned to make before her squash detonated in the microwave. To make the quick version, toss spaghetti squash noodles with enough sour cream to lightly coat them, season with salt, pepper and chopped garlic, and place in a buttered casserole dish. Top with a mixture of sharp grated cheese and fine breadcrumbs, and bake until bubbly and brown. Yum. "We cut our spaghetti squash in half, par bake it until just barely fork tender.. turn it upright,fill with hot lentil chili, cover in cheese.. Return to the oven until the squash is fully cooked through and the cheese is all melty and bubbly.. ohy gooey goodness.."
"I cook whole spaghetti squash in the microwave all the time, but you must puncture/pierce the tough skin in 6-8 spots with the tip of a heavy knife or something to release the steam before starting to cook. After it is cooked until almost soft, let cool a while (10 minutes) and cut in half, scoop out the seeds, fluff and separate strands with a fork, finish cooking or refrigerate until ready to use." " No one included temp. when bakeing." "I eat them as often as I can buy them. Just cut in half, scoop out the seeds and fill with a mixture of cubed meat, baby spinach, fine sliced red onion, grape tomatoes, cheese and a spoonfull of yoghurt or cream or any dip or pesto. wrap in foil and bake for 40 minutes or cover and cook on high in the microwave for around 10 minuters. Such a versitile vegetable because it's only limited by your imagination. Add some spices and try them with a zing of international flavours. " "Got some growing in my garden. They are about 4-5" long. I'd like to harvest some now as in my experience immature vegetables usually taste much better that the fully grown specimens. Any thoughts?" "Joe, the strings don't form until the rinds harden, so you may miss some of the fun by harvesting too soon. But if you need to harvest one or two, by all means give them a taste. " "Will spaghetti squash grow well in the Philippines?" "Tom, because it is a rather primitive C. pepo strain, I tend to think it might work. You would grow it just like any other summer squash." "Will it grow in northern England or will I have to grow in a green house?" "They grow quite easily, I threw the seeds from one last fall into my compost bin and surprise, surprise, I have a dozen or more volunteer plants everywhere in my garden, beautiful, but if not well supervised, they will take over everything"
"Hi :) I'm in Cape Town, South Africa. I finally got hold of spaghetti squash seeds. I've been germinating them and 3 have come up beautifully. I will be planting them outside in about 2 weeks, cannot wait to finally get to taste this amazing veg!" "In our community garden we have a real problem with squash vine borers. Is spaghetti squash more resistant to those??? " "Martha, like all squash classified at C. pepo, spaghetti squash is susceptible to borers. The get good genetic resistance, look to the C. moschata species, which includes butternut squash and Long Island Cheese pumpkins. "